Savant has +1 strength for each unused MU. 2credit: Break 1 sentry or 2 code gate subroutines. Δεν υπἁρχει τίποτα μόνιμο, εκτός από την αλλαγή. Can the Runner use Savant to break 1 code gate subroutine? Yes. Because the ability does not say "if able", it will resolve as much as possible when used. If you're going for the free-MU / Deep Data Mining style Savant is not a bad decoder. Assuming you're at 4 free MU after installation you get a decoder that for breaks 1-2 sub 5-or-less strength codegates for 2 and 3-4 sub for 4 and on top of that can break sentries if you don't have a killer installed yet. Code gates with more than 5 strength are relatively rare. Just look at the list. On the other hand DNA Tracker is sufficiently nasty and popular that it warrants having a plan against it. That means either having a way to get extra MU (Akamatsu Mem Chip and friends) or having some kind of backup breaker. Compared to good old Gordian Blade Savant is harder to install (2 while eating MU for strength) but way more efficient on the first code gate. On the other hand Gordian Blade once boosted keeps its strength and is 1 per sub instead of 2 for 2 subs so given enough code gates in a run Gordian Blade may eventually be more efficient. For a somewhat realistic scenario: 2 code gates of which the highest strength is 4 and 3 subs each Gordian Blade is 2 to boost and 6 to break while Savant is 0 to boost and 8 to break. Gordian Blade is a lot more flexible in strength though, which is nice when you run into the aforementioned DNA Tracker. 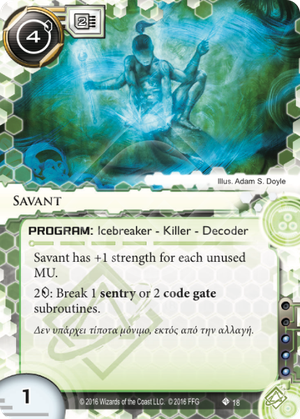 Savant on the other hand is effectively a semi-AI, being able to break two types of ice. Sure, the per-sub price on sentries is high but it does give you that warm fuzzy feeling of knowing you can run into a sentry without taking damage, provided your bank account has enough credits (6 should cover most cases). Because Savant only works well in decks that go heavy on the MU it's a specialty option. But in such decks it should work very well.